Much like four years prior, 2006 looks relatively empty by most standards. Linkin Park was in the midst of an eighteen month writing process for their third album during 2006, only playing the Grammy Awards and four shows in Japan in August. It should be noted that they did do a few things differently than normal. The band would begin celebrating their upcoming ten year anniversary by dragging the Xero track "Reading My Eyes" out of the closet and playing it in Japan. A brand new song entitled "QWERTY" was debuted in Japan and sent the online fanbase into a frenzy for new Linkin Park material. Armed with a new setlist and a well rested band, Linkin Park nailed their Japanese shows and got fans ready for a new album. Finally, this would be the first time that Linkin Park would appear at the same venue that Fort Minor would be performing at as well, giving Mike Shinoda double duties for these appearances (both Summer Sonic shows in Osaka and Chiba City). 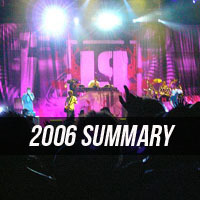 The year wasn't without its surprises... Before embarking on the Japanese mini-tour, Linkin Park would win a Grammy Award for their collaboration with Jay-Z and perform with him and Sir Paul McCartney on the same night at the Grammys, creating a song cleverly titled "Yesternumb" ("Numb/Encore/Yesterday"). No tours, although Styles Of Beyond opened for the Tokyo 2006.08.10 and Sendai 2006.08.15 shows.